Spoons are great fun to play and we all have them in our homes, so there's no need to go out and buy expensive instruments! Jo runs Spoons Workshops in schools and at teachers' conferences, as well as for festivals, community groups, parties and other events. 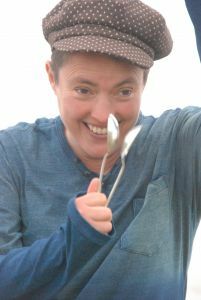 She will teach your staff the basics of spoon playing and how to use it in their classrooms, as a stand alone music session, and also with ideas of how to incorporate it into cross curricular projects. Jo will provide an assortment of spoons - metal, wooden, plastic and joined-up ones - and teach a variety of techniques which are then built up to create a routine, often accompanying a song or tune. Jo sometimes works with another musician who provides a fantastic instrumental accompaniment for the workshops. Here's an informal video with fiddler Linda Game, giving an insight into the basics of spoon playing and the workshops - https://youtu.be/9ERU7Vl4LGM. This is just a starting point, and workshops are geared towards the appropriate age and ability of the groups. All workshops are tailored to suit your requirements and can be adapted to tie in with your particular theme or project. "The workshop presents a great overview of lots of different techniques; perfect for arming teachers with the basics of spoon-playing with scope for developing further in the classroom. Jo really breaks everything down into accessible chunks, meaning that even the most dubious participants quickly grasp some of the trickier rhythms. She’s an easy-going, charismatic workshop leader and it’s impossible not to be inspired by her infectious presentation style." "Thank you both so much for a truly fantastic day! We all thoroughly enjoyed your sessions and I feel our children are so lucky to have had the opportunity to experience your workshop. Having live music is such a treat and I know it will have been the first time that many of them will have heard it first-hand and playing such unusual percussion instruments as the spoons will be something they will never forget... Aside from the rhythms, sounds, skills they learnt in playing the spoons you covered just about every 'physical' objective there is going: body awareness/bilateral integration/crossing the imaginary midline/hand-eye coordination/hand dominance/muscular strength/sensory processing and so it goes on!" "Jo leads her workshops with infectious energy and fun, leaving children and adults of allergies engaged, excited and eager for more!"